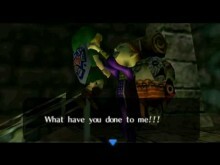 Gossip Stone: What Changes Should be Included in Majora’s Mask 3D? By now you’ve most likely heard the news that Nintendo officially announced that Majora’s Mask is coming to 3DS this spring. With the promise of as yet unknown ‘added features’ we are left to speculate on just what changes should or will be made. Hit the jump for further discussion. It is light on details, but that leaves us lots of room for speculation. The most obvious place to look for ideas is at Ocarina of Time 3D. When Ocarina of Time was translated over to the 3DS the animations were enhanced and made more fluid. The Boss Gauntlet was added allowing the player to unlock a sort of battle royale where you have to defeat every boss in a row. The Water Temple was simplified, the Sheikah Stones were added to help the player along, and Navi was updated to nag players to take a break. So, while it is possible that the ‘added features’ could amount to little more than shuffling the menu buttons to fit better with 3DS controls, it could also mean new battle modes, altered weapons, or streamlined dungeons. What would you like to see added, corrected, or otherwise improved in Majora’s Mask 3D? Let us know in the comments!